As I was sitting down to put some fun dates on the calendar for February (date night! massage!) I realized I never shared my theme for this year on the blog. Eek! I spend so much time working through this process and helping others through it with the Holiday Council, I think I just needed a little break from it in January. But themes and ways of being and the expressions of those intentions are vital to how I live day by day, and since I’ve committed to sharing the very real “strategies for joy” I use in my own world, I knew I couldn’t just skip over my theme this year. To take intense pleasure or delight, to make merry, to take satisfaction. I want to revel in my mamahood, my business, my relationships, my choices, my contentment. Some people like to craft a theme and then sit back and observe the magic that naturally arises. They don’t make action plans or ask themselves if they are deliberately honoring their theme. And that’s a totally beautiful and valid way of using your theme. But I’m an activator — putting some skin in the game with effort and edge pushing and progress tracking does it for me. I don’t stop at declaring the word, I want to rev it up and express it in everything from goal setting to getting dressed to how I spend my weekends. Some of my “goals” or “things to do” are sweet and simple. They act more like reminders to myself — care for your body, Molly. Honor your family with love, respect and dose of silliness. Be present. Have fun. Treasure what is. Others are big and scary — especially the two business goals that I’m going to be spending an entire year “reveling in” before I get to reveal them to the world. Talk about skin in the game! Hope you have fun taking a peek at a few of Holiday Council worksheets, sugar. So, how do I actually use these worksheets? 1. Set quarterly maintenance and project goals. 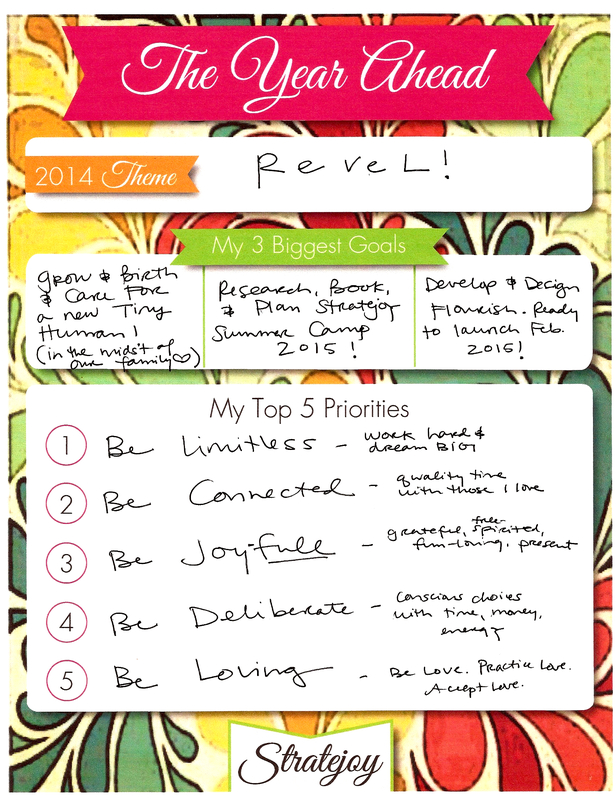 I operate well with goals and a bit of sacred structure in my life. 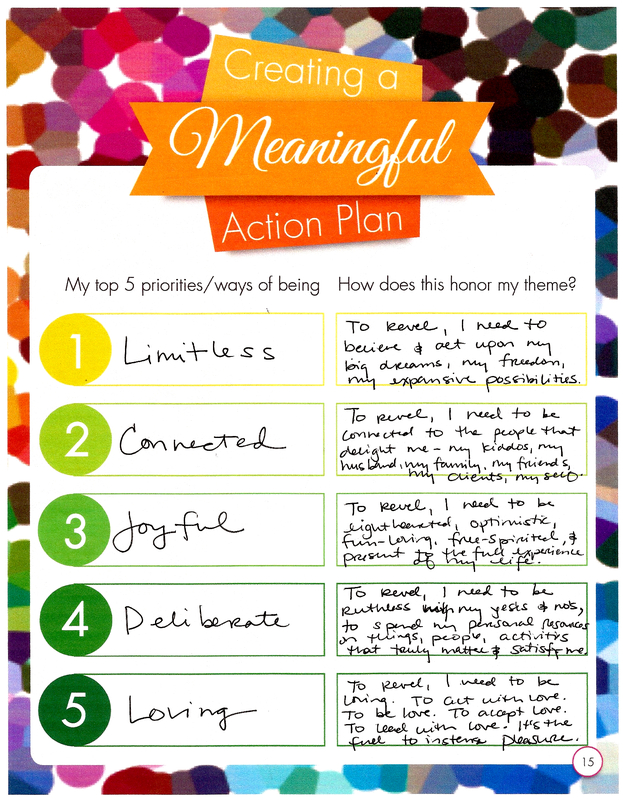 I use my theme and “ways of being” to help me pick specific areas of focus each quarter — one maintenance goal (requires daily effort, doesn’t usually have an end point, is more of a habit) and one project goal (measurable progress along the way, check off when finished). In the first quarter of 2014, my maintenance goal is to “Grow a Tiny Human” which involves sleeping as much as I need, regular check-ins with my midwife, prenatal yoga twice a week, vitamins, swimming, and starting my Hypnobirthing affirmations and meditations in March. Sometimes I like to have a tracking/measuring success system in place for maintenance goals, but for this particular one, I’m being gentle with myself and simply listening to my body about what it needs in the moment. My project goal is to start researching and planning Stratejoy Summer Camp for 2015 — with deliverables that include booking a location and catering, hiring a project manager, capturing my vision, and starting work on branding. Running a summer camp has been a dream since I’ve been a kid and starting work on this idea thrills me. It’s the perfect example of a goal that feels like “making merry” to me! 2. Prioritize what is important to me this year. As an ambitious woman, I have a million things I’d like to do; but as a busy mama and business owner, I understand I can only do a limited amount of them at any one time. Otherwise, I’m simply inviting burnout, exhaustion and stress into my life. Having a theme and clear “ways of being” help me concentrate my personal resources (time, energy, money) on what I’ve declared most important to me this year. They most often come up when I’m weighing options: Does taking this trip or staying at home feel more like reveling right now? Does pursuing a high visibility guest writing spot or fleshing out my own content schedule contain more intense pleasure or delight for me? In order to revel in my life, should we buy that fixer upper on the beach or just relax into our rental home? 3. 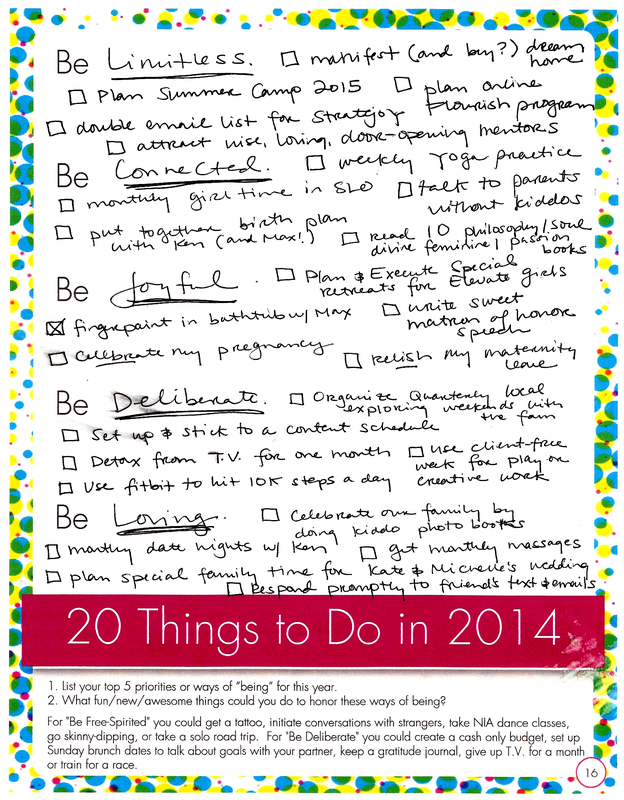 Use the “20 Things to Do” list to fight boredom or blahness. I always try to include a mix of big and tiny ideas on this list. They aren’t necessarily goals (unless they get elevated to a quarterly maintenance or project goal) but ways of explicitly honoring my intentions. I love referring them when I feel blah about life, when I find myself turning to mind-numbing distractions (emotional eating or drinking, television, endless internet surfing) instead of engaging in my life, or when I feel bored with my day-to-day. Currently, I’m reading Awakening Shakti, Max and I have been messing around with fingerpaints, I started a photo book for Max’s first year, I’m 9 days into a month without television, we’re hashing out a new content schedule for this blog, and and I enjoyed girl time, date night, and a monthly massage in January. Would I have done all this without this list? Perhaps. Does it help reminded me how I want to engage with my own life? Absolutely. Deliberate structure doesn’t dampen creativity, joy, or freedom — it creates room for those priorities. Here’s what I want to know now — what is your word of the year? How do you use it? Share your brilliance with us! p.s. Want to join us for the next Council? Get on the wait list and learn more. p.p.s. Aren’t those worksheets gorgeous? Mad props to Victoria Stanley for designing those beauties!